Wacom has announced a huge discount on its Cintiq Companion Enterprise model. There are plenty of deals and sales floating around at this time of the year, but this $1000 discount on Wacom's Cintiq Companion Enterprise – announced today and only while stocks last – stands apart from the rest. Perfect for drawing on when you're working from home at your desk while hooked up to your main computer, as well as being ideal for sketching on directly while you're out and about, the Cintiq Companion 2 is a beefy Windows tablet that can run with familiar versions of Painter, Photoshop and so on. Powered by Intel® Core™ processors and topped off with added security in the form of vPro Technology and aTPM chip, this is a worthwhile investment for digital illustrators. Boasting a superior pen-on-screen experience (we're talking 2048 levels of pen-pressure sensitivity with the included battery-free Pro Pen) this creative tablet is ready to live up to the needs of the most demanding artists and designers. 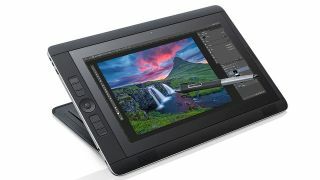 And at just $1999.95, the Cintiq Companion 2 has just become more accessible than ever. Grab yours now before they run out!